With GlassViews where you can see some of our favorite patterns and see all of the pieces in a pattern - across the color spectrum. One of the most interesting patterns ever produced is Fenton Cactus and this is our first fully documented pattern. 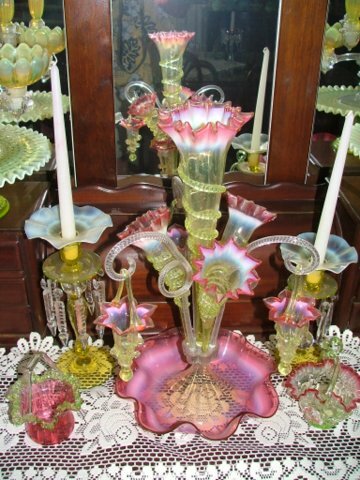 Many of us who have worked to create GlassViews are Vaseline Glass collectors so you will see a special emphasis on companies and patterns in which Vaseline Glass was produced. If you have photos to contribute, links to suggest, or want to be involved with pattern documentation, please contact us. We hope you enjoy GlassViews! CDs will soon be available along with glass items in our Showroom. Among our featured companies - only some of which are presented on our web site - are Atterbury, Baccarat, Beaumont, Belmont, Brockwitz, Daum, Davidson, Dugan, Duncan & Miller, Fenton, Fostora, Gibson, Greentown, Hoffman, Imperial, Jefferson, Levay, Model Flint, Mosser, Murano, Northwood, Pairpoint, Portieux, Riverside, Stevens & Williams, Val St. Lambert, Vallerysthal, Viking, Westmoreland, and U.S. Glass.